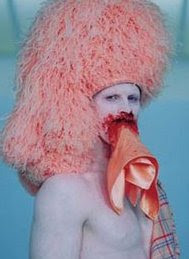 "The first mistake Matthew Barney made in his corny two-hour performance, "REN," at a Santa Fe Springs car lot Sunday night, was in the choice of starring automobile. The 1967 Chrysler Imperial had obvious meanings. It was that kind of night. Clichés were practically announced via bullhorn to several hundred invitation-only guests. So provincial was the vision of the West that a better headline star would have been a 1967 Chrysler New Yorker. " "Consider the interminable event over not on the day the troops come home from Baghdad or a replacement for a petroleum-based economy is found, but on the night the Chrysler Imperial's car hood shows up on the turntable at Christie's auction house."